Crostini is just a fancy word for a a tiny toasty with delicious toppings. They’re an easy, versatile and crowd-pleasing party snack. And shouting “Crostini!” makes you sound like a Jawa from Star Wars. It’s taken me a while, but I’ve discovered something about myself. I have tunnel vision. I get an idea in my head and I become obsessed with it (for example; that fun little blog that we were supposed to update every once in a while only when something interesting happened). Sometimes it’s a television show, sometimes a book, or a place. When we’re going to throw a dinner party, it’s usually one particular dish that hooks me. In one sense it’s great because I love researching recipes and techniques, figuring out flavor combinations and the best ways to prepare a specific thing. The problem is that I can get so obsessed with that one thing, that everything else falls by the wayside and becomes an afterthought (or on more than one occasion, a never-thought). Oh, you wanted something other than just a huge slab of ribs at the party? This is especially true for me when it comes to appetizers (or ‘starters’, as Matt calls them in an oh-so-adorably-English way). I usually forget all about them and then, once hungry people are already in my house, I rummage to see if there are any non-moldy cheeses in the fridge I can pull out. So recently, being a much better host than I, Matt politely suggested that we think about and actually prepare a “first course” for the dinner we were planning with our wonderful friends, Larry and Catherine. I know, he’s so weird. This was how the conversation went. I’m so glad he pushed because it got me thinking about great things that can be made for a crowd really quickly and easily which lead me directly to Crostini. Seriously, what’s quicker and easier than toasted bread with stuff on it? Not much. Especially when you can do prepare everything hours ahead. So let me take a Nerdy detour and talk about the difference between Crostini and Bruschetta. Mostly it’s down to the type and size of bread used. Bruschetta, from the Italian word “bruscare” meaning “to roast over coals” is made by toasting whole, wide slices of a rustic Italian or peasant type bread. Think open-faced sandwiches. Crostini are sliced and toasted rounds from fine-grained long bread, like baguette. Both can be topped with all sorts of different things, from simple to complex. Personally, I think a party with cocktails and several different types of Crostini would be amazing. The possibilities are endless but here’s a few combinations I thought would be delicious. So, on to the one we actually prepared which was inspired by the roasted grapes from our Farro Salad recipe. For the cheese, we used Cambozola, which is a Brie-style pasteurized cow’s milk cheese with the barest hint of blue veining. 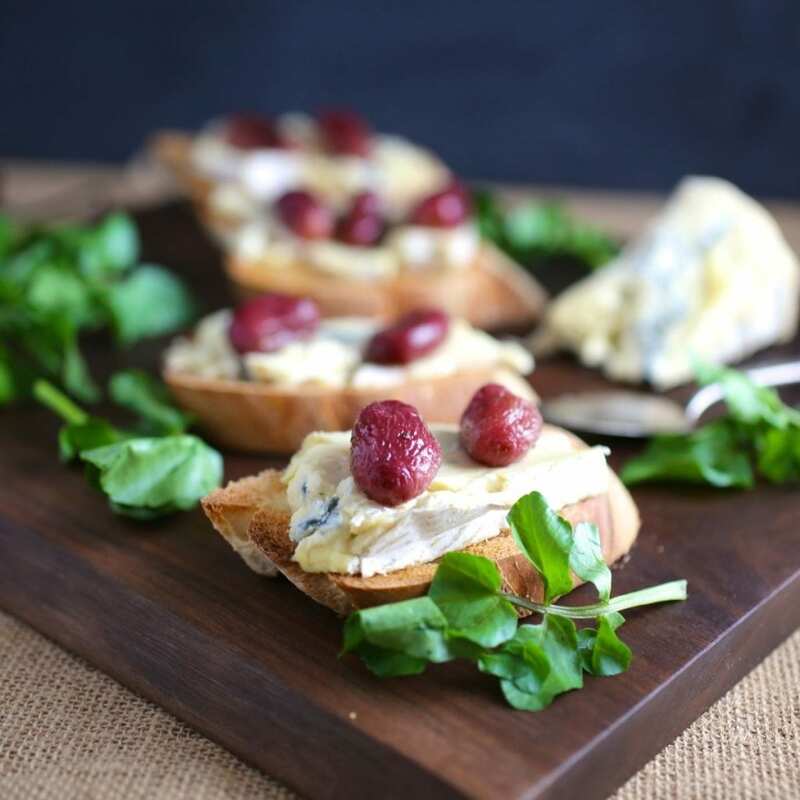 It’s a great “starter cheese” for those who might not be fond of very assertive blue cheese flavors. 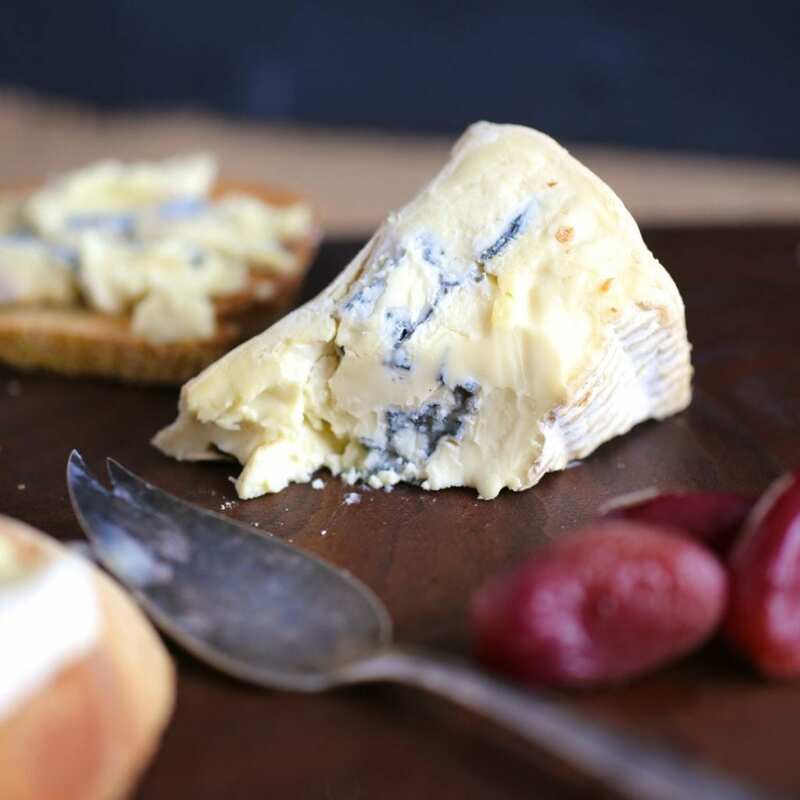 Another great option is Gorgonzola Dolce, which is a soft, blue, buttery cheese made with cow’s milk. It gets its name from a town in Lombardy near Milan, where it is said to have been created in the 12th century. I love history. 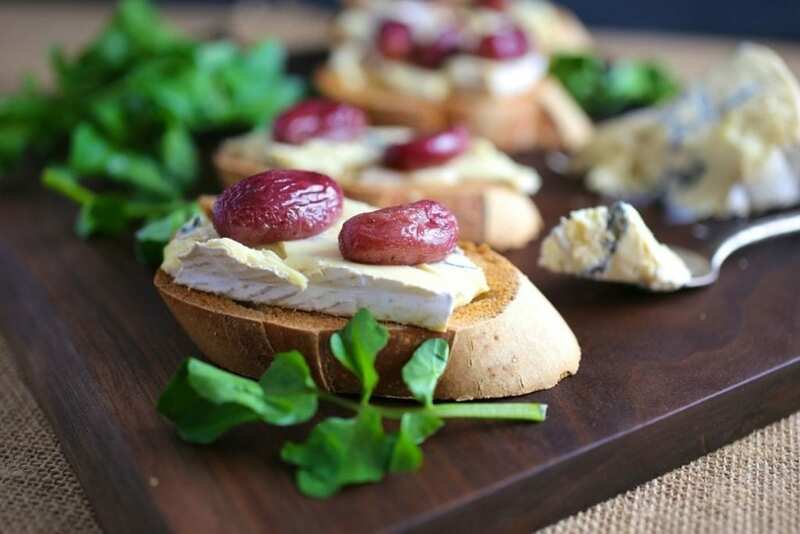 Both cheeses pair extremely well with the delicate sweetness of the roasted grapes but you could certainly use a sharper blue or even a goat cheese or brie. On a separate baking sheet, spread out the grapes and drizzle with olive oil and sprinkle with salt and pepper, to taste. Roast grapes for about 15-20 min, until they burst and release some juice. Shake the tray once or twice during roasting. (Can be made 4 hours ahead. Set aside in a bowl along with any juice from the pan). 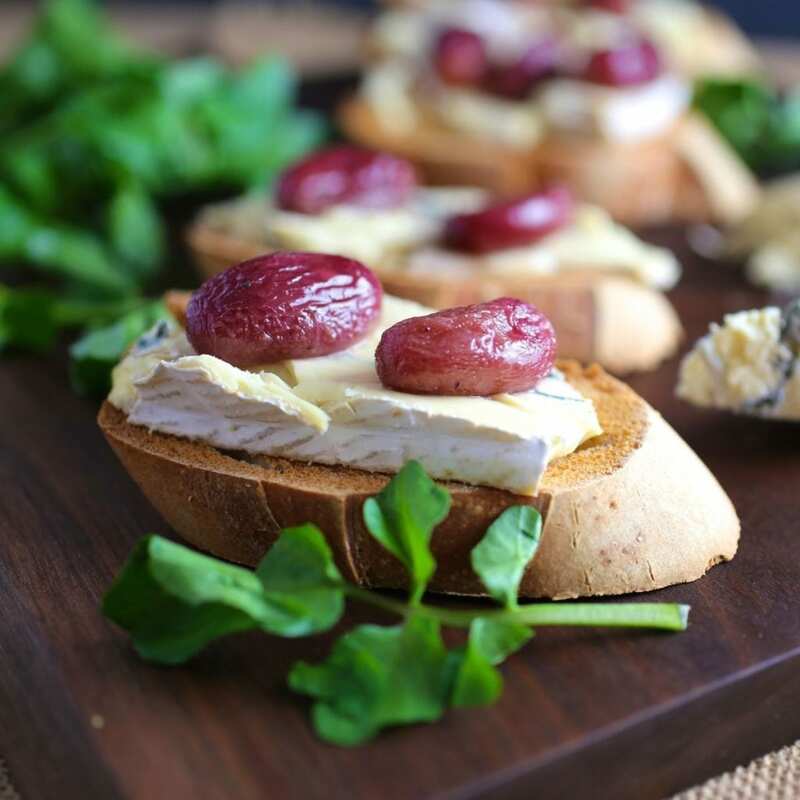 Spread blue cheese on baguette slices. Top with two or three grapes and sprinkle nuts over each (if using). Drizzle each slice with some juice from the roasted grapes. (If serving as a first course, I like to add some lightly dressed greens such as baby kale, arugula or watercress. Just toss about 2 cups with a tablespoon of olive oil and 2 teaspoons of balsamic vinegar). When I read your list of various toppings it brought back memories of Sunday at my Grandmother’s house. She used to serve baguette rounds with fresh ricotta and cracked black pepper. It was my favorite treat…I was under ten at the time and it was by far my favorite. It is hard to get really fresh ricotta here in SW Florida, but I am going to try my old favorite with your addition of lemon zest and olive oil. Yummy. I totally agree. Good, freshly made ricotta is just so great almost on its own. When we lived in Brooklyn we used to get it from a place right around the corner called Caputos and they would make it fresh every day. It was outrageously good. We haven’t found quite the same quality but we can at least have a few good choices. You need Marc to overnight you some! I love all your recipes, anytime I’m stuck in a rut I check your page out. You guys are amazing, please make a book!